Today, we open the vaults once again to get to the heart of the reason I started this series. The whole idea of “From the Vaults” is to take a look back at movies and video games of the past and judge them on their impact on their respected industries how the film has held up over time. 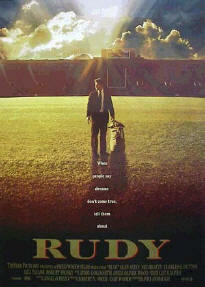 With that said, there are few movies from my life that represent the intent of this series than Rudy. The story of the plucky little guy from small town Illinois to defy the odds and play for the Notre Dame Fighting Irish is one of those all around feel good movies of the 1990’s. Anyone who has watched Rudy instantly becomes misty eyed by the story of the little engine that could, myself included. I loved watching Rudy when I was a young kid. So much so, that for a time, I cheered for the Notre Dame Fighting Irish Football Team myself. But over the years, the question still remains, does the movie hold up to this day? 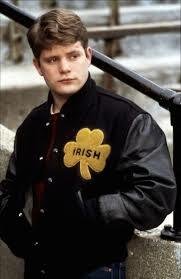 Rudy is the story of Rudy Ruettiger (Sean Astin). He is a young man who was never big enough or strong enough to play college football, nor did he have the grades to make it to a Joliet University. But gosh darn it, the little guy has heart! After his friend dies in a factory accident, Rudy moves to South Bend in the hopes of getting into Notre Dame and playing football for the Fighting Irish. While everyone in his life, including his brothers, father, his ex-fiance, and all points in between, Rudy works hard and eventually sees his dream through to fruition. The story of a plucky underdog, coming up from the bottom, against all the odds, and all the naysayers to make something out of his life… Yeah, this thing is pretty cut and dry when it comes to the inspirational sports movie. That isn’t necessarily a bad thing. As most of them have proven, they can be a very lucrative story and an easy to watch enjoyable. You will be hard pressed to find anyone who has any glaring problems with the movie of Rudy itself. On face value it is classical, safe, family sports movie. I am not going to sit here and say that Sean Astin has had a stellar acting career on par with some of the all time greates of our time, not saying that at all. The guy has been in his fair share of forgetful or bad movies. But overall, his career hasn’t been terrible and his place in The Lord of the Rings has Rudy to thank for that placement. Personally, I have always been a fan of Astin and he is a guy who has that plucky little guy image that you just want to root for. Maybe it is his youthful face or his short stature, but I always enjoy him. Astin was in a few other movies during the time, but the big one out of all of them was easily Rudy. 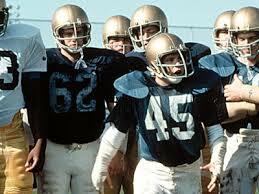 So let’s talk about Rudy Ruettiger, the man behind the legend. Rudy was luckily a success. The movie was well received by critics and it has aged gracefully. However… The reason Rudy was made comes down to a lot of shady dealings that have hurt the film over the years. It is reported that Rudy Ruettiger himself, who thought that his story was so good, constantly hassled Hollywood producers to make his life into a movie until someone finally relented. The story then seemingly changes a lot of Rudy’s story including the villanous portrayal of Coach Dan Devine, who was supportive of Rudy throughout the years, and the fact that Rudy being carried off the field was more of a joke than respect for the player. I guess it is to be expected. Hollywood needs to mold reality to fit the Hollywood formula. But when it is done in such a way that seemingly completely alters the story of someone, it does come across as very sleazy, and hurts the future of the film. Beyond what I have written, there isn’t much more to it than that. Rudy is a feel good sports movie that has a rather questionable source material. It is made palatable by Hollywood and fed to us in a way that is enjoyable and doesn’t make us think too much. It is as easily forgotten in our mind as it is ingested into our bodies. Like a snack food, it is instant and fleeting gratification. How does Rudy hold up over the years? Well… It holds up okay… But it has certainly wavered in popularity and reception instead of grown. Even after the story of Rudy is revealed for what it is, it is still a decent story. It is told well and even knowing the true story of Rudy Ruettiger, it will still tug at your heart-strings. The acting is decent, the cinematography is okay, and the soundtrack truly brings home the story. Over all, it is a decent watch that you will quickly forget. Thank you for reading and as always, if you enjoyed this review, please like and subscribe for more.